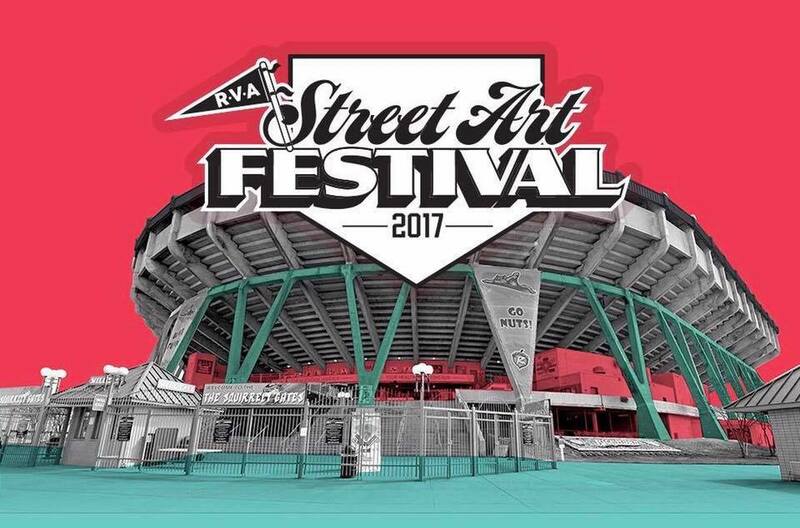 Street artists and muralists from all over the United States will flock to The Diamond this weekend, to turn the dull concrete baseball stadium into a vibrant piece of Richmond culture for the fourth RVA Street Art Festival. More than 250 buckets of latex paint, cans of spray paint, sculpture supplies and more will be taken to the home of the Richmond Flying Squirrels to create a mixed-media canvas. Since the first RVA Street Art Festival in 2012, at the Canal Walk, the event has drawn people from all over the city and given artists an outlet to create freely. “You’re not dealing with a client so within reason you’re able to do exactly what you want, completely your idea and your execution, that’s something that’s is always a draw for me,” said local muralist and board member Mickael Broth. It transformed the old GRTC bus depot in 2013, and last year, the street art fest went to Manchester to give life to the drab Southern States silos. But for this year, the board is excited to partner with the Richmond Flying Squirrels to bring art and sports together. Flying Squirrels Chief Executive Chuck Domino broke the news about the festival with Street Art board members in June and was equally excited to have the festival come to the stadium. “This will be an incredible opportunity for the Squirrels. It’s going to help bring new people to our ballpark and help grow our charities supporting renovating inner city baseball diamonds in underserved communities,” he said in a spring news release. One of the festivals missions is to showcase local and national artists. Richmond artists, Andre Shank, known as “Bomb Proof” has partnered with visiting Brazilian artist, Zéh Palito, to paint the crown of the stadium. The two started the project earlier in the week and plan to have every panel of the crown painted by Sunday. “It’s really cool, think about people driving through Richmond on I-64 or I-95 and seeing that art on the crown,” Benson said. Along with the crown, the stairs, columns, walls and the interior of the VIP areas will become a canvas for the over 35 artists attending the event. “The more I do this for a living (paint) the more I realize those opportunities are not that common and you have to use them as best you can,” Broth said. One artist, Rachel Owens, earned her spot on the walls of The Diamond through a pop-up art event she won at Triple Crossing Brewing. This will be Owens’s first time painting on a wall and will be a great opportunity for her to showcase her talents. 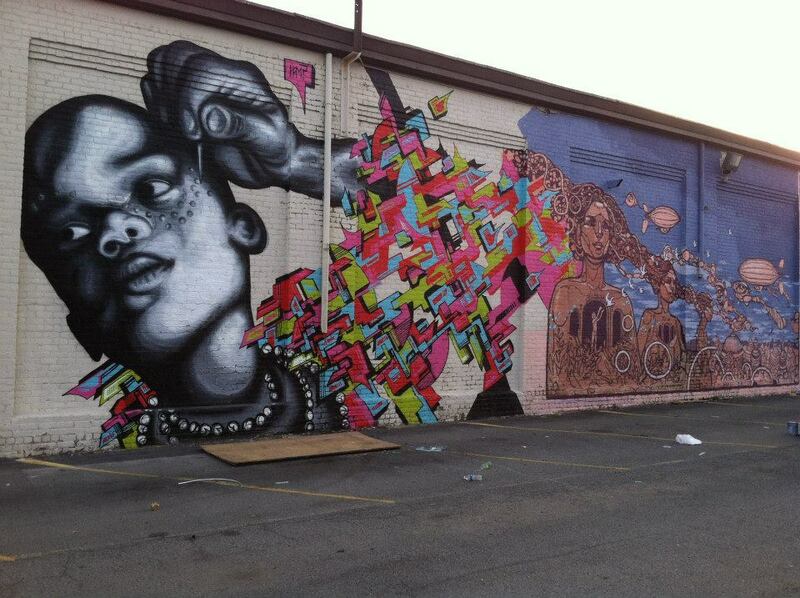 While the large murals will be the main attraction, the creativity of the event expands beyond the concrete canvas. “While we are known as the Richmond Street Art Festival, we want to branch that out to not just street art but we have sculptures, we have music, and we have some interactive art with kids,” Benson said. The festival will include an artist village where visitors can buy and see art from other local artists. Scott’s Addition print shop Studio Two Three will be there making screen prints and t-shirts. Art On Wheels will also be there doing a pendulum art piece and making a sculpture out of painted wood. Live music, a variety of food vendors, and beer trucks will be at the event as well. And the festival has a solid musical lineup for the day with soul/funk powerhouse Kenneka Cook, jazz.hip hop artist Mckinley Dixon and Crystal Pistol Records founder/folk artist Saw Black. Feral Conservatives, Chance Fischer, Michael Millions, Dead Letter Officers, Manatree, DJ Mike, and Mekong Xpress & The Get Fresh Horns are also scheduled to perform. “When you put street art up you don’t know how long they are going to be up for, but during that place in time when we are all together in the community it’s beautiful,” Benson said. Another goal of the festival is to raise money for arts education for children. This year’s beneficiary is Connor’s Heroes, an organization dedicated to supporting children undergoing cancer treatment and utilizes art as a medium of healing. The 2017 RVA Street Art Festival kicks off Fri. Sep. 22nd from 5 p.m. to 9 p.m. and will continue Saturday from 11 a.m. to 7 p.m. and Sunday from 11 a.m. to 5 p.m.